Rumble strips: what are they used for? Home › Advice › Rumble strips: what are they used for? Rumble strips, raised profile line markings or audio tactile profiled (ATP) road markings, are road markings that generate noise and vibration when you drive over them. The lines are painted like normal road markings except the machine drops ridges (also called blocks or ribs) at intervals. This is made of fast-drying thermoplastic which dries and bonds with the road within around 10 minutes if the air temperature is 15 degrees Celsius or higher, or cold applied plastic (PMMA). The majority of the rumble strips laid in New Zealand are PMMA. The interval spacing can be adjusted: ridges close together form a higher sound than ridges spaced further apart when vehicles drive over them. The picture above shows both types of line: one with the ridges to the left of the line (in the direction of travel of the vehicle), and the other on yellow centre line where the ridges form part of the line. The tactile feedback of the lines is a big advantage to drivers, especially on wet nights when normal road markings can become extremely difficult to see. The raised profile means water runs off them and makes them easier to see, and if the driver still has problems discerning the edge of the lane, the vibration through the steering wheel and the noise in the car will give absolute confirmation. They are also an advantage in areas where drivers are known to have problems staying awake. Putting them on the centre line and edge line can alert sleepy drivers that they are drifting. This feedback can also help distracted drivers (e.g. parents with misbehaving children in the back of the car). The benefit to road authorities of these lines is that drivers don’t like driving over them which means that they don’t wear out so quickly. While they cost more to paint initially, they cost much less in maintenance over the longer term. The application speed is important because the vehicle used to apply the line must travel at a consistent speed regardless of the slope of the road otherwise the transverse ridges of thermoplastic will be unevenly spaced. NZTA specifies that speeds must be able to be held within +/-10% on +/-12% gradients when fully laden. NZTA also requires that the spacing of the blocks must be accurate to within -20/+30% of the specified values (usually either 150mm, 250mm, 350mm or 500mm). The height is between 9-12mm. There is some concern that motorcyclists and cyclists can be affected by the markings that therefore wherever those road users would need to cross them, a gap of at least 20 metres is left. Motorcyclists avoid road markings when wet because they are slippery. The raised profile gives them better opportunity to see the ridges and avoid the lines. Tests overseas and in New Zealand have not found that the ATP lines create any risk to motorcyclists. Edge marking are also made with marker posts and cat’s eyes – read more about those here. 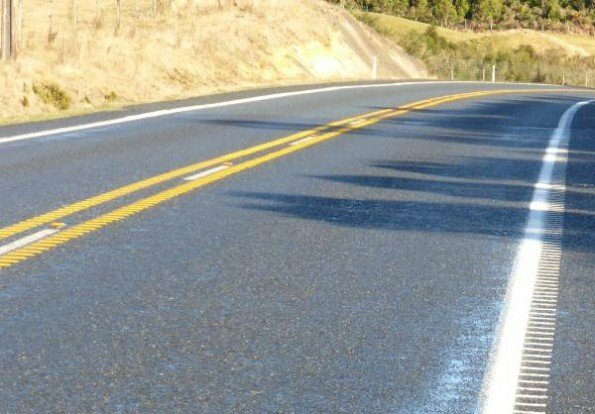 If you are interested in finding out more about road marking, the NZ Road Markers Federation can be found here.